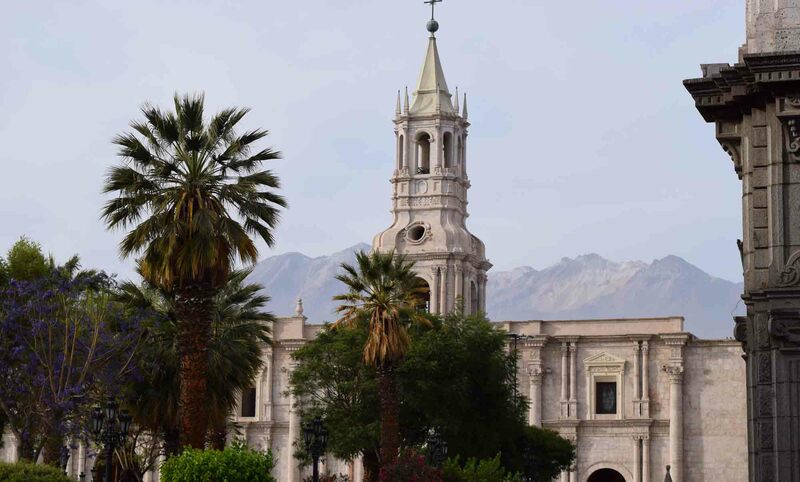 You might say that Arequipa is the perfect subject for ‘Sunday Spotlight’. It’s a pretty little town, not a big city, and it’s not the most well-known destination in South America, but it’s a rewarding place to stop. 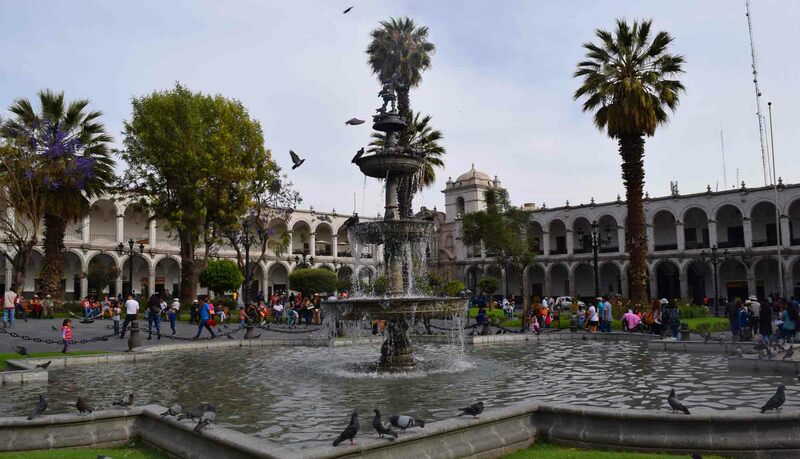 I thought it was a very worthwhile stop in Peru, much more pleasant than Lima, and although Cusco is probably more interesting, Arequipa doesn’t have the hordes of tourists that Cusco does, and as a result doesn’t have as many touts. It is, however, at altitude perched at 2,335 metres. That’s still around 1000 metres short of Cusco, but I still felt the effects of the height when I was there. Mind you, it was just minor ‘out of breath’ issues, nothing that really knocked me about. It’s not flat, like many cities in the mountains, but everything you’re likely to want to see is walkable. The surrounds are very pretty, there’s a lookout you can go to which is the one thing a little way from the old city, but I found the view from my guesthouse roof was pretty amazing in of itself. Fountain in the Plaza del Armas. mas where everyone gathers to meet up. It’s an attractive and large centre square and there’s a great fountain in the centre. Around each side are shops and restaurants, and there’s tourist information centres as well. 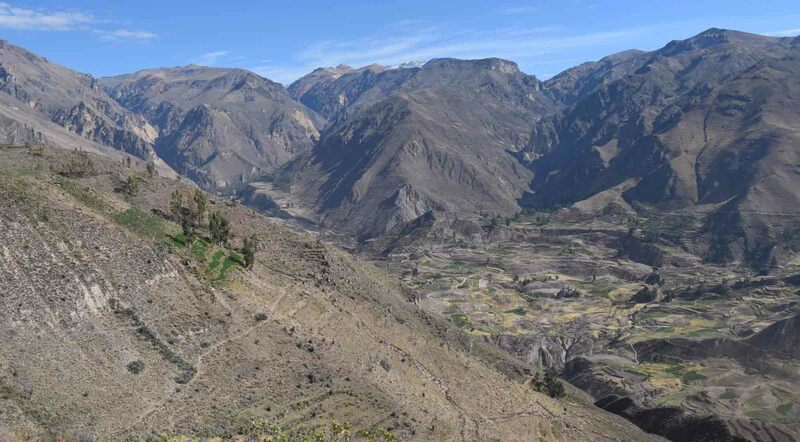 On top of that, there are plenty of shops that will organise trips for you to surround locations such as the breathtaking Culco Canyon, as well as transport onward to your next destination. I’m sure you could even organise Machu Picchu tours from places here if you wanted to – but you might as well do that from Cusco. 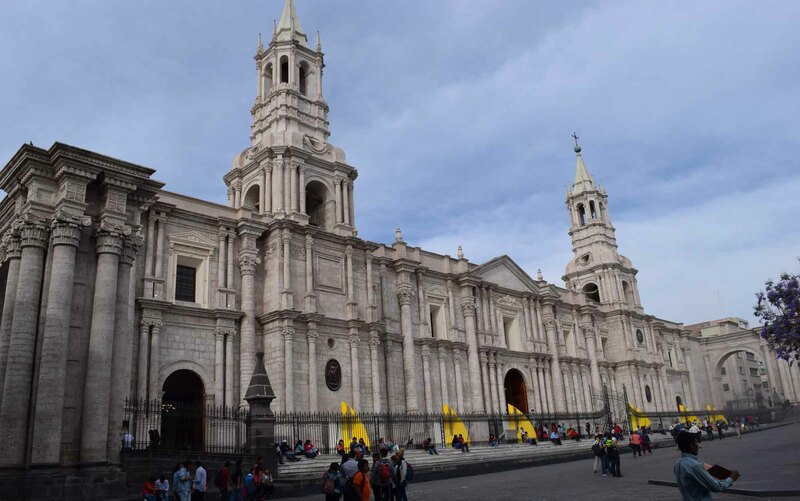 On one side of the square is the Basilica Cathedral of Arequipa. It’s enormous and is open at certain times of the day and closed at others. 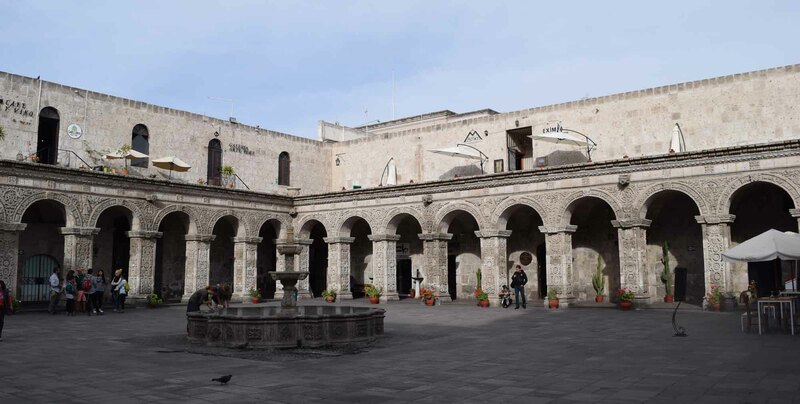 It dates from the 16th century and there is a cathedral museum to visit should it take your fancy. 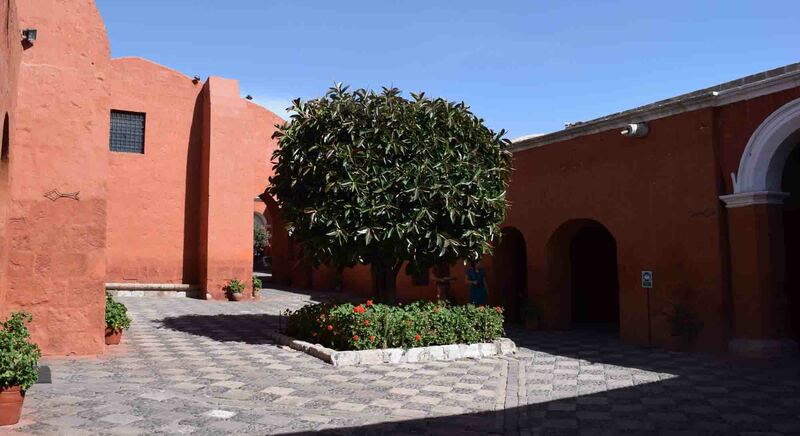 Courtyard in St Catherine Monastery. Arches in St Catherine’s Monastery. 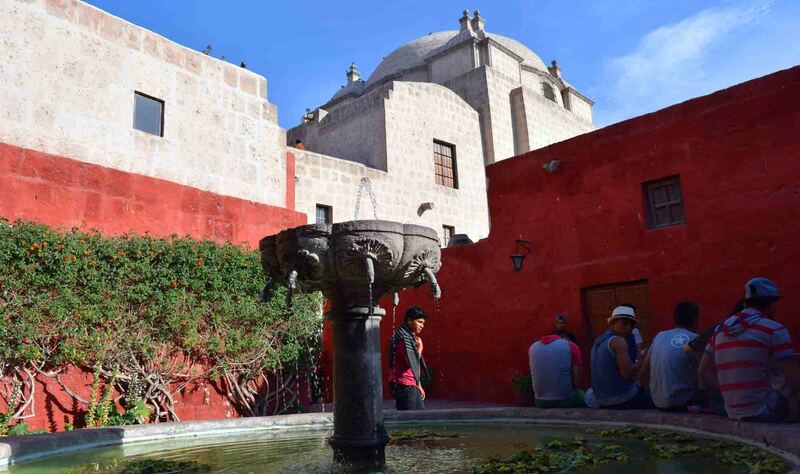 Also dating from 16th century and arguably Arequipa’s biggest tourist attraction is the Santa Catalina (St Katherine’s) Monastery. It’s really worth a couple of hours to explore, it’s very large and has so many buildings to enter. There are fountains, cobblestone pathways, it’s really wonderful. 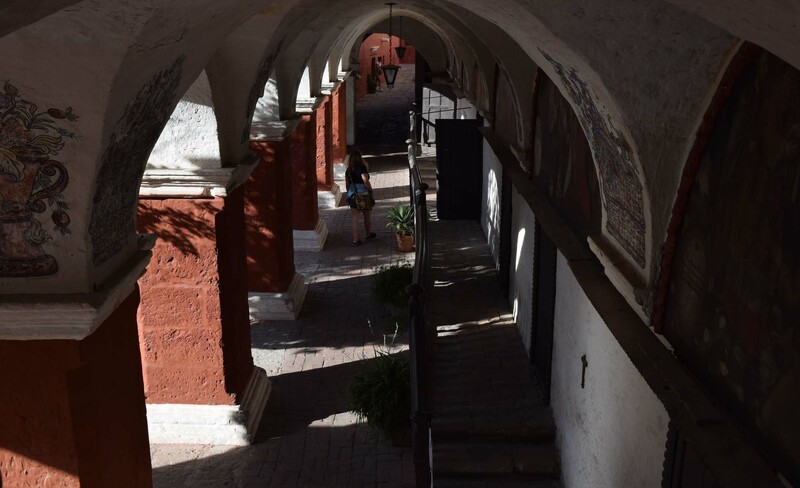 You can go up to the roof at one point too and see across the mountains for another breathtaking view of Arequipa and it’s amazing surrounds. Courtyard in the Museum. No photography allowed inside. I saw ‘arguably’ because the town has one other ‘big’ attraction. Although actual it’s not that big! It has its own genuine Incan mummy! 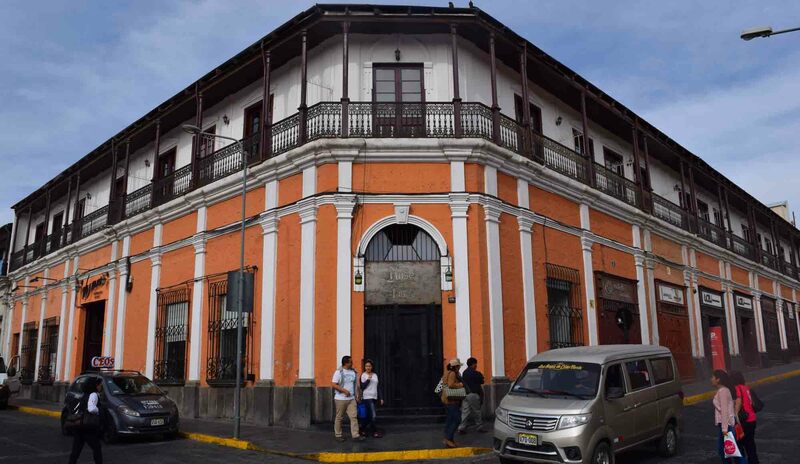 At the Museo Santuarios Andinos the whole place is built on the discovery in 1995 of a mummy atop the Nevado Ampato. ‘Juanita’ is what she was named, and the museum provides a movie on her discovery before you get guided around three or four rooms of artefacts. Finally, after you’ve seen stuff replicated or discovered on the mountain you get to see Juanita in a glass box. The atmosphere has to be perfectly maintains of course, and the room is extremely dimly lit as well with photography naturally banned. 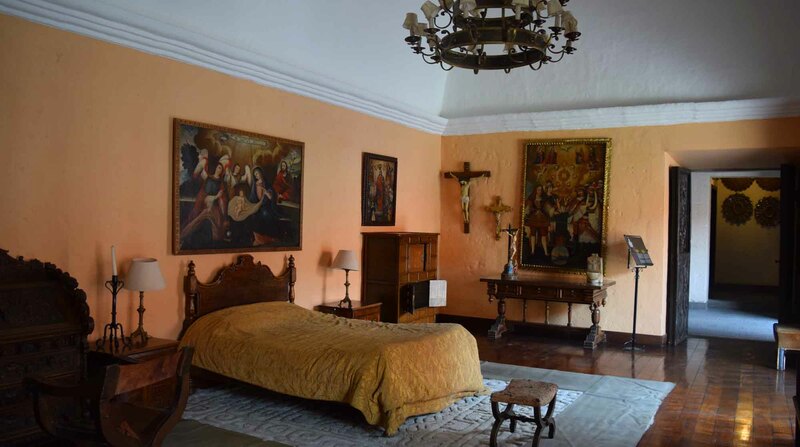 Bedroom in the Casa del Moral. 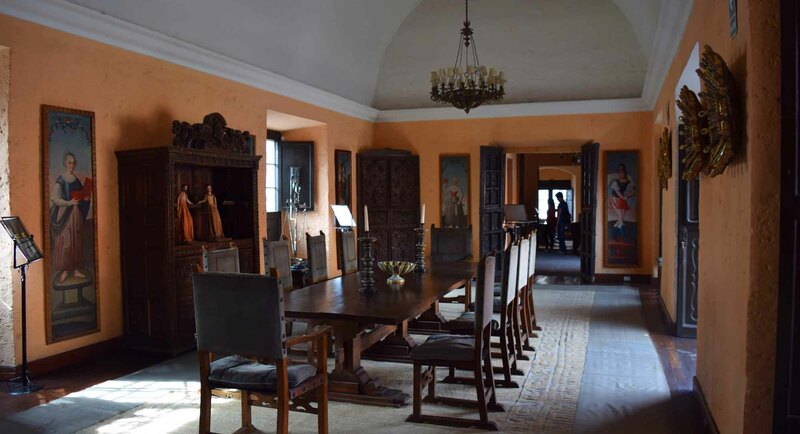 Finally, well worth a look is the Casa de Moral. It’s an historic house that can be visited, colonial of course, and there’s a bit of history you can learn about there. 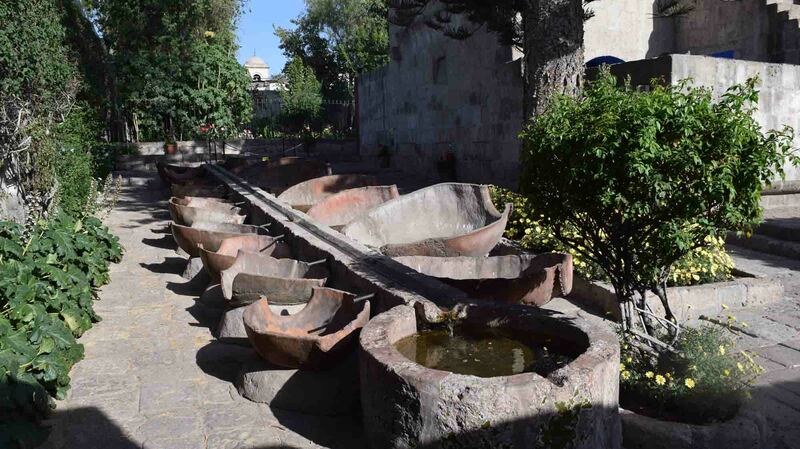 And so, there’s a very brief snapshot of Arequipa. Definitely worth a visit if you’re in Peru! Thanks for reading, take care and May the Journey Never End! Another place I had never heard of until you wrote about it! St Catherine’s Monastery looks lovely!